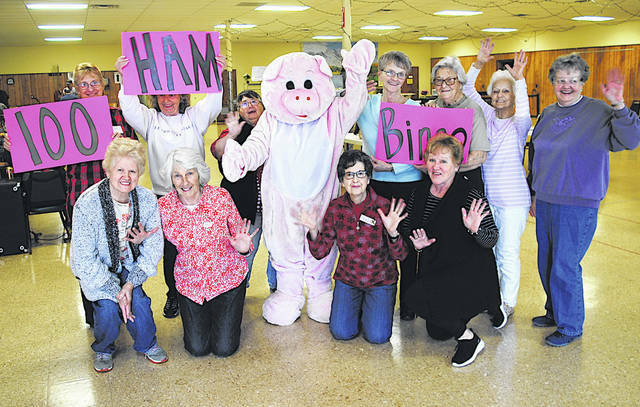 One hundred 13-pound spiral hams will be awarded Saturday, April 13 when the Highland County Senior Citizens Center hosts Ham Bingo. The doors open at 11 a.m. The games will run from noon until approximately 4 p.m. The event is open to the public. Cards are 25 cents per card, per game. Participants must be 18 or older to play. Throughout the day homemade noodles along with chicken, pulled pork and other snacks and drinks will be available for purchase. There will also be separate raffles. The event is a fundraiser for the senior center. Members of the senior center posed for this photo announcing the event Tuesday. For more information call the center at 937-393-4745.